CHARLOTTE, NORTH CAROLINA (WriteGood!TheNews wire service) — Republican presidential nominee Donald Trump’s first classified intelligence briefing has validated nearly every conspiracy theory ever, the candidate said today. Speaking at a rally in North Carolina, Trump hinted that the briefing, traditionally given to presidential nominees, revealed shocking, long-held secrets, but he refused to discuss details. “Obama? I thought he was born in another country,” said Trump. “Seems I was off by about 25,000 light years. Unbelievable! •	Rosebud was the sled. Presidential candidate Hillary Clinton will receive a similar briefing, although hers must be conducted at night, Trump learned. (WriteGoodWire Services) – Responding to revelations that the National Security Agency secretly monitored the phones of millions of foreign citizens, the agency hopes to make amends by offering a free Domino’s pizza or stuffed cheesy bread to everyone affected. Files leaked by Edward Snowden suggest that the agency tracked the mobile phones of 60 million Spanish and 70 million French citizens in a single month, including the cell phones of the leaders of allied countries. 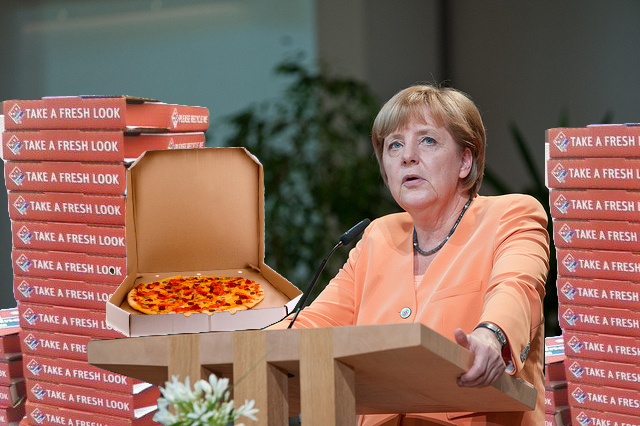 Chancellor Angela Merkel of Germany displays her free pizza – an apology from NSA for monitoring her cell phone. The NSA also offered to kill one person for her. Analysis of NSA surveillance operations worldwide revealed that 438-million calls were to order pizza for delivery. Another 86-million requested pizza for pickup, 327,000 added a side salad, and only two calls discussed plutonium. In the hope of quelling protests by citizens overseas, the agency is promising a free medium thin-crust pizza – one topping only – to every person whose name appeared in NSA files. Trained field agents will deliver the pizzas personally, although for security reasons will leave them in train depot storage lockers, beneath drain pipes, or in the dark corners of abandoned factories. “But within 30 minutes,” said the release. “The NSA is deeply sorry for any inconvenience you might have experienced in our efforts to defeat terrorists and their organizations at home and abroad,” the release stated. “Customer satisfaction is our number one goal, although we cannot divulge to customers what we do, where we do it or who is harmed in the process.